Ducks gather in the shallow canal in Lockport. 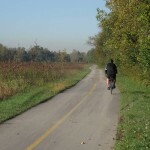 When the Des Plaines River meanders away from the trail, the river is replaced by a remarkably quiet stretch of open grassland. 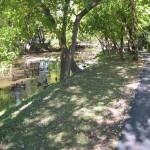 Open stretches of the Des Plaines River appear regularly along the trail. 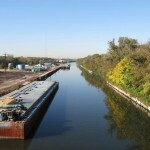 The Chicago Sanitary and Ship Canal is a working canal with plenty of barge traffic. 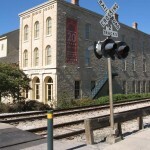 The Gaylord Building in Lockport once served as storage for materials used in building I&M Canal. 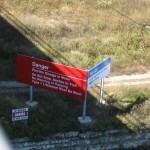 Now it contains a restaurant and a museum dedicated to the canal. 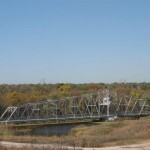 The Romeoville Road Bridge overlooks one of the electrical barriers built to keep the Asian Carp out of Lake Michigan. 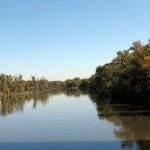 Much of the northern half of the route offers a surprisingly remote feel as it cuts through many acres of wetlands and bottomland woods. 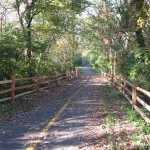 Before reaching Romeoville Road and the Isle a La Cache Museum, the trail passes through a heavily wooded area. 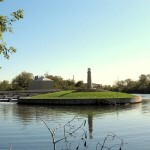 The small lighthouse-like structure marks the confluence of the Chicago Sanitary and Ship Canal and the Calumet Sag Canal. 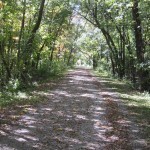 The Centennial/I&M Canal Trails are featured in Best Rail Trails Illinois. Prairie Fever is powered by	WordPress 3.5.1 and delivered to you in 0.188 seconds using 33 queries.